Preheat oven to 350 degree. Spray a 13 x 9 inch baking dish with nonstick cooking spray. In a small saucepan, heat chicken broth. In a large bowl, combine beans, corn, and rice. Add hot chicken broth, 1 cup cheese, soup, sour cream, and salsa, stirring to combien. Stir in chicken. Pour mixture into prepared baking dish. Bake, uncovered, for 45 minutes. 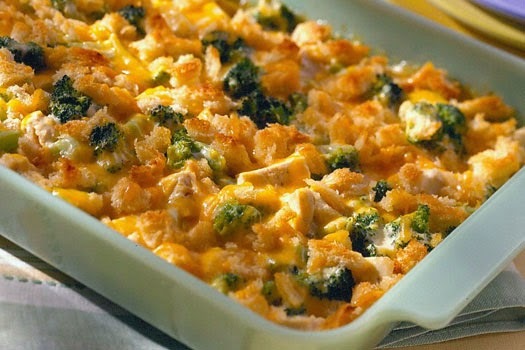 Top with remaining 1 cup cheese, and bake for 15 to 25 minutes longer or until center is set and cheese is golden brown. Note: Used Springer Mountain Farms Chicken Thighs.